Emma Livermore from our Norwich travel agents, instore at Jarrolds, went in search of Santa in Swedish Lapland. Here’s everything she managed to cram into a magical day. I had never heard of Enter Air before, but I was very impressed. The seats were comfortable, spacious and had a good amount of legroom. We were served a hot meal in both directions and they offered us drinks with the meal, which included a good selection of hot or cold options. There were also drinks available to purchase too. The staff were very friendly and helpful. The trip included return flights with hot meals, a two-course hot lunch, hire of snow boots/snowsuit, husky sleigh ride, reindeer sleigh ride, snow mobiles, a visit to Santa with a gift for children and unlimited hot berry juice and locally made ginger biscuits. It is really difficult to pinpoint a favourite part of the trip as it was all amazing. I loved the whole scene of where this was set in Sweden. It was like stepping into Narnia, especially the walk through the forest to find Santa. To find Santa there was a short walk through the forest with lanterns to light the way. Half way there, you get to stop next to the open fire to warm up and have some berry juice and ginger biscuits. The husky ride was one of my favourite things, it was lovely to see how excited they are and then to be pulled along through the forest was magical. The snow mobiles were quite fun as well. They take some getting used to but are really good fun when you get the hang of them. To be honest, it would be difficult to suggest something to improve on. The whole day worked perfectly and I think there was more than enough time to do everything available at least once. I would definitely recommend this trip to all customers. It’s an amazing day out for families with plenty to keep the children entertained. They receive an activity pack on the way out, sing Christmas carols on the plane and there is so much for them to do when you arrive. 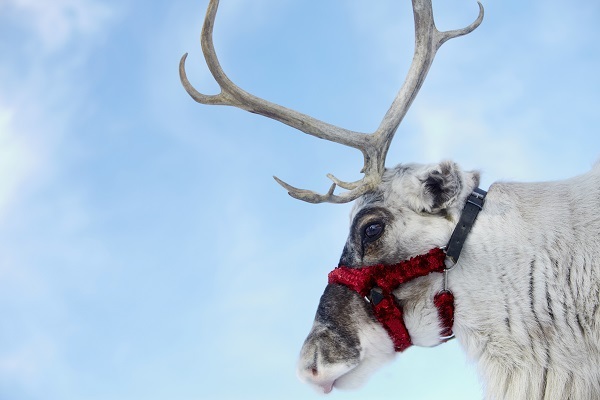 The activities include husky rides, a reindeer safari ride, a ride on the snow mobiles (with an adult), sledging, building snowmen and even snowball fights. With everything included in the cost, it's great value for money and everything is so well organised. A perfect day out! Newmarket's visit Swedish Lapland, in a place where a Swedish farmer turns his farm into a winter wonderland for the winter. The only people visiting each day are the people booked on the flight with Newmarket Holidays and I think this works very well as it doesn't become overcrowded. They split the flight into four groups and suggest times for each group to do activities. Again, this works very well because everyone doesn't turn up at the same time for each activity, meaning there is less queuing and the day flows much better. There is a small shop in the main building where customers can purchase hot or cold drinks and snacks, as well as any souvenirs, for a small cost. They will also accept sterling or credit debit cards too. If you would like to take a day trip of your own to Lapland in 2017, we can organise a magical adventure like the one Emma enjoyed. Drop into your nearest branch of Fred. Olsen Travel or visit any of our travel agents in East Anglia and on the south coast.